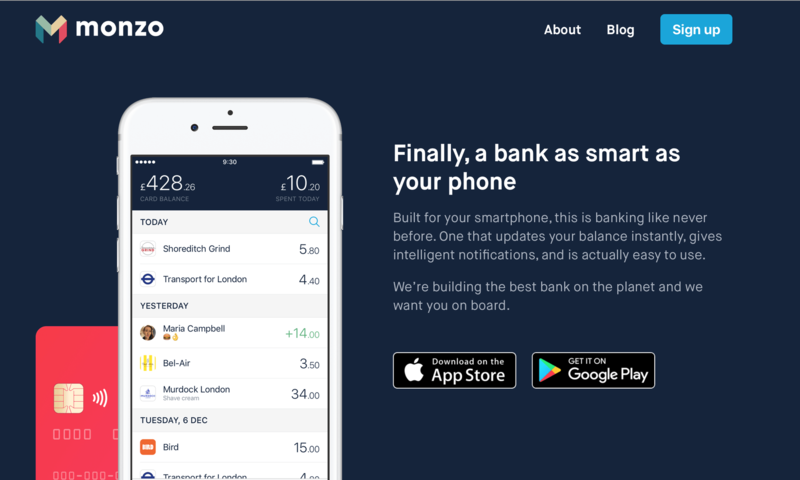 Monzo is surely one of the top fintech success stories of recent years. Founded in February 2015, the personal banking provider is now on course to reach between 500,000 and 800,000 users by the end of 2017. How did it grow so fast? One of the key factors has been its viral waiting list, which has attracted a huge share of Monzo’s initial customers. In this article, we’re going to walk you through how to build a practically identical waiting list for your product. 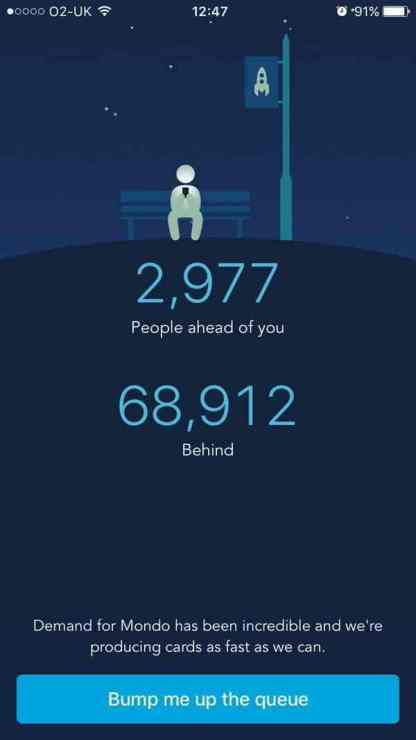 The user can see how many people are ahead of them in the queue and how many are behind them. Just below, there’s a CTA button offering the chance to jump thousands of places up the queue “Bump me up the queue”. The choice of CTA copy – “Bump me up” – is inspiring. On one hand, its colloquial tone makes the button seem friendly and clickable. On the other, it creates a sense that Monzo is on the user’s side, helping them get an advantage over the rest of the queue. To further inspire FOMO, the user is informed that the top 4,000 would get access to the card before anyone else and the referral numbers would be reset after a couple of weeks. Genius. 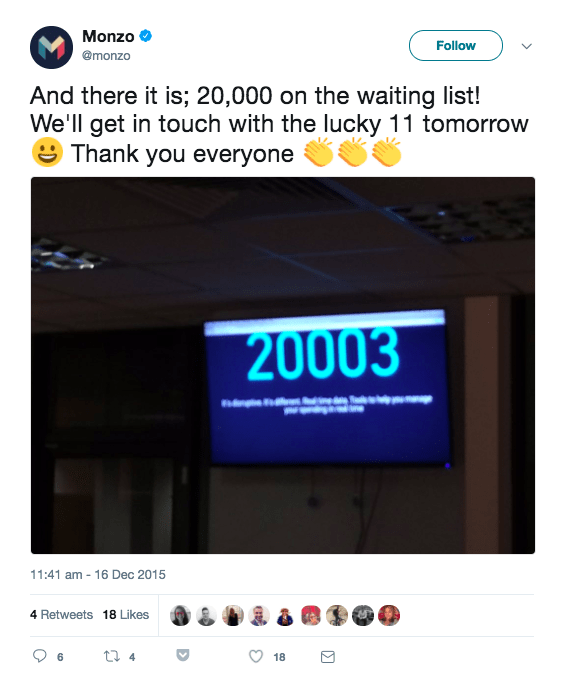 This is where the waiting list starts to generate viral growth. Each user is given a unique referral URL to share with others online, typically via social media. Whenever someone reaches the Monzo sign-up page via the referrer’s unique URL, the referrer gets “bumped up” the queue. It’s thanks to this mechanism that Monzo has gained such a high level of viral exposure on social. …they can do so by sharing their unique URL and giving Monzo free publicity. Maître includes a tool called Viral Waiting List. It’s a complete solution for setting-up, building and managing viral waiting lists, just like Monzo’s. You can see how it works here. First thing’s first: you need to decide how you are going to motivate people to join your waiting list. One of the most common reasons people subscribe to waiting lists is to gain early access to something exclusive. We created a list of previous prizes which succeeded here, also our customer list is a great place to look. 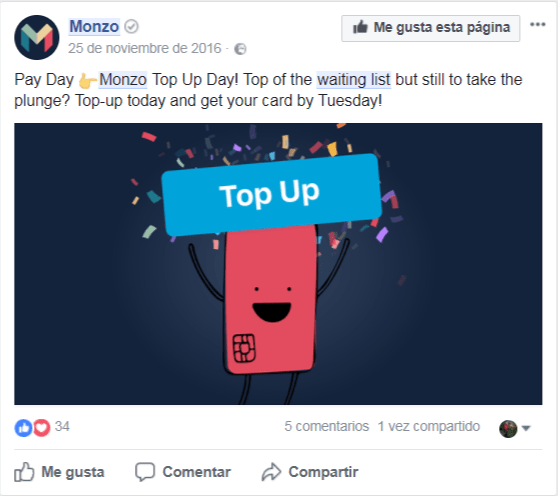 In Monzo’s case, the exclusive offer is access to the nice pink bank card before anyone else; in other words, access to their core service (but I am sure the pink card definitely served a purpose). Before you start your campaign, you need to decide what your exclusive offer will be. This could be something like early-bird tickets for an event; an exclusive initial product sale; or access to the beta version of an app. The signup form for your waiting list is one of the most important elements of your viral campaign. 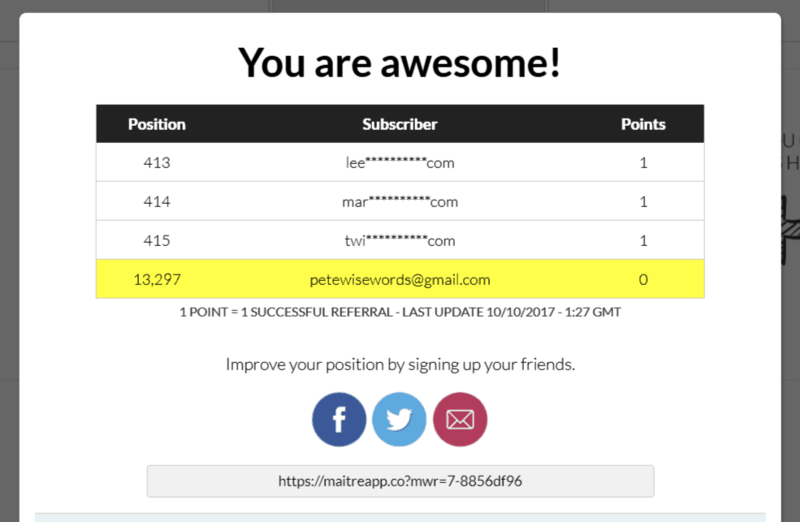 Maître Viral Waiting List comes equipped with a tried-and-tested, ready-made signup form. You can add it to any page of your site by copy-and-pasting some code into your website’s HTML. This is how it looked for Bubble (they used Maître, and generated over 10,000 sign-upsfor a short competition). You can customize the form’s appearance from the Maître CMS, including copy, colour, etc. The options you choose will be reflected in the code generated, which you can then add to your website backend. If you need finer control or extra functionality over your referral campaign, you can use your own custom code and link it to Maître using our API 2.0. There’s not a lot you need to do to change how this waiting list view operates – it’s built to succeed without much customization. However, you can change the list’s appearance and copy to suit your brand. Below the list, the user can see the rewards they can gain by making referrals and climbing up the rankings. 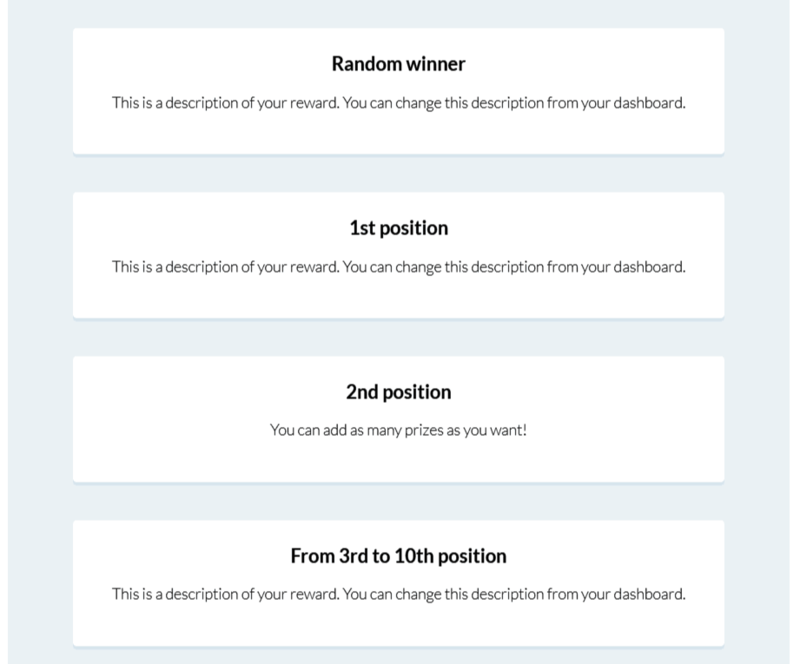 You can decide which levels of reward are available to users, and what users get for reaching each reward level. In Monzo’s case, the reward is simple: when you reach the top of the list, you get the product. This can be a highly effective approach – but you might also consider adding extra rewards to encourage users to work harder to make referrals. For example, you could reward the top 1,000 with paid access to your product, and the top 10 with free access, as a bonus. Another thing you can do is having a random winner so that everyone is encouraged to sign-up. There’s infinite scope for you to be creative with the rewards you offer. This is where your waiting list sign-up form will be accessible to the public. Deciding where exactly to place your signup form on your landing page is an art and a science. Try running some A/B tests to find the highest-converting design. We highly recommend marketing your waiting list via your social media, website blog and other digital channels. By bringing more leads into the picture, you can magnify the effect of your waiting list’s viral incentives. You should be proud to share the progress of your waiting list. According to Monzo’s CEO Tom Blomfield, Monzo will reach somewhere between 500,000 and 800,000 pre-paid customers by the end of 2017. Now you know how they pulled it off – and how you can do the same.